Over the years of making hand drums we have evolved into making many different styles. The principal is the same for them all; rawhide pulled over a wooden frame. But there are many different uses for hand drums and thus many different subtleties in their construction. We live in a region of Quebec where families hunt for food. The old ways are not forgotten. People still have a close connection to the land and the animals which live around them. Throughout the season we gather those deer and moose hides. 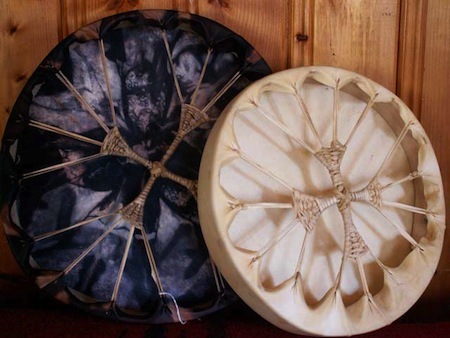 These wild hides are a hugely important part of the finished hand drum. There is a strong energy and medicine which comes from wild animal skin. Email us if you are looking for rawhide and, or drum frames to build your own drum. We make two basic styles of wood frames: the traditional steamed frame (ash) and the modern pieced together or mitered frame (butternut, pine or cedar). The old traditional frame would have been made from local wood which could easily be bent. Not all woods are made to be bent. Out west, the drums were made with cedar, in the middle of Turtle Island brown ash, and up north birch was used. We have a great supply of white ash near our home, so we cut it to width and dimension and steam the wood. After enough steaming, the wood can be bent into an approximate circle. Although I am going for round, few hoops are perfectly round. The only way to get them all perfectly round is by using factory techniques. I have a feeling that the drums of our ancestors were not exactly round either and I have noticed that life is kind of like that. Not always perfect. The modern perfectly round hoops are made with plywood. Our most common hand drum is the natural tan colour which everyone is well accustomed to. We also make a modern dyed hand drum for those of us who are more visually inspired. We soak our deer or moose hide overnight in a black walnut dye. The effect is unusual and really cool. We make our hand drums with deer, moose and buffalo. There is a huge difference between the different animals. Deer is thinner, open pored, louder and tends to be popular for Round Dance Singers, Smoke Dance and Women’s community singing. We usually describe deer as more of a singing drum. Moose and buffalo are tighter, denser, and tend to be used more for ceremonial and sweatlodge. The old ceremonial healing hand drums were moose or buffalo. I also believe that the perfect Round Dance drum is a moose drum. At countless powwows when the hand drum competition starts up (late on Saturday night) every deer drum in the circle is flat but our moose drums are singing loud and clear. (Guess who wins the competition?) Moose is very resistant to humidity issues, so if you tend to drum in humid situations consider a moose. The echo and vibration of the hand drum can be heard throughout the world and the beat of our hearts resonates with the beat of the drum.